Kathy Rusk from Quilts of Valor is pictured with Kenji Yaguchi (seated), his wife Kazi, and their daughter Marlene Hill and her husband Jack. 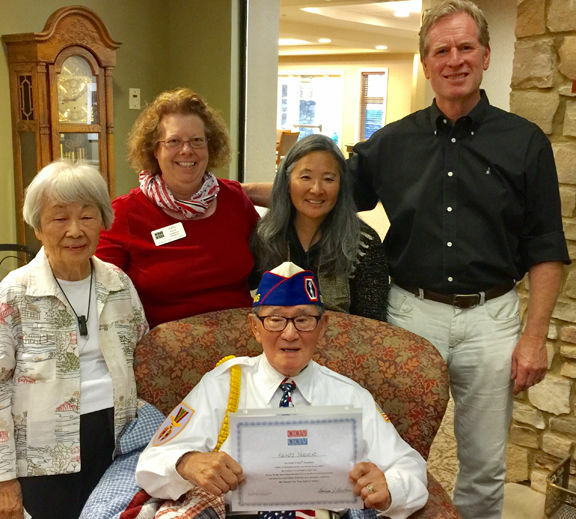 Kenji Yaguchi was honored by the Quilts of Valor Foundation at Good Samaritan Society — Fairfield Glade. The mission of the Quilts of Valor Foundation is to cover service members and veterans touched by war with comforting and healing Quilts of Valor. Yaguchi was a member of the 442nd Regimental Combat Team that was comprised of young Japanese-American volunteers whose families had been shipped to detainment camps. The 442nd suffered terrible losses. In one company, of the original 200, only eight survived the end of the war. The 442nd was the most decorated unit of its size and length of service in the history of the US Army. The members earned 9,486 Purple Hearts. Yaguchi has two of those Purple Hearts in addition to a Silver Star. The unit was awarded eight Presidential Unit Citations (earning five in a single month). Twenty-one of its members were awarded Medals of Honor. On Oct. 5, 2010, the Congressional Gold Medal was awarded to surviving members of the 442nd. It is one of the three highest civilian honors presented to those who served the security and national interests of the United States. In 2012, the surviving members of the 442nd were made "Chevaliers" (Knights) of the French Legion of Honor for their actions in liberating France and their heroic rescue of the "Lost Battalion" near Biffontaine. Read more about Kenji Yaguchi by clicking HERE. 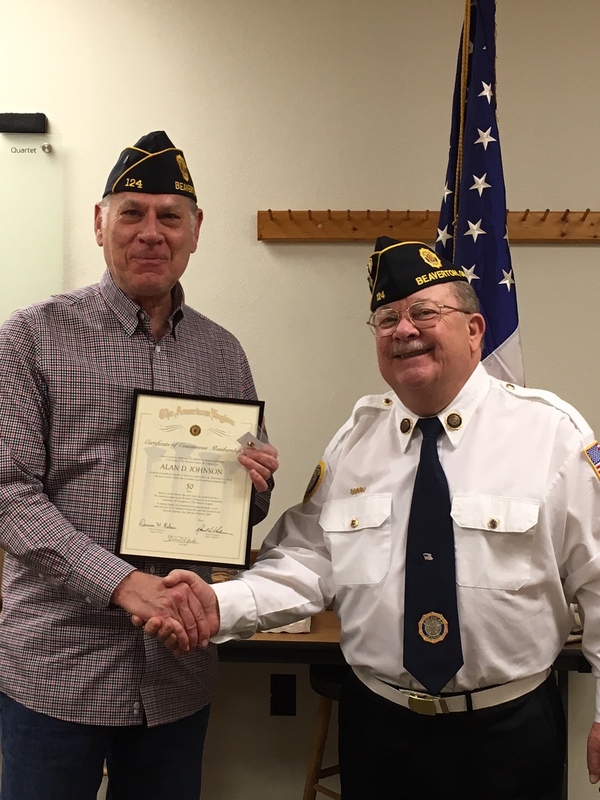 Congrats to Post 124 Member Alan Johnson. Ceremony at Beaverton Veterans Memorial Park included American Legion Post commander Steven Gerber, Tualatin Valley Fire & Rescue Chief Mike Duyck and Beaverton Police Chief Jim Monger. Members of a generation of Oregonians who endured and fought for our nation's way of life more than 65 years ago were recognized and remembered at the World War II Memorial Honor Day ceremony, February 12, 2013, in the governor's ceremonial office at the Oregon Capitol. 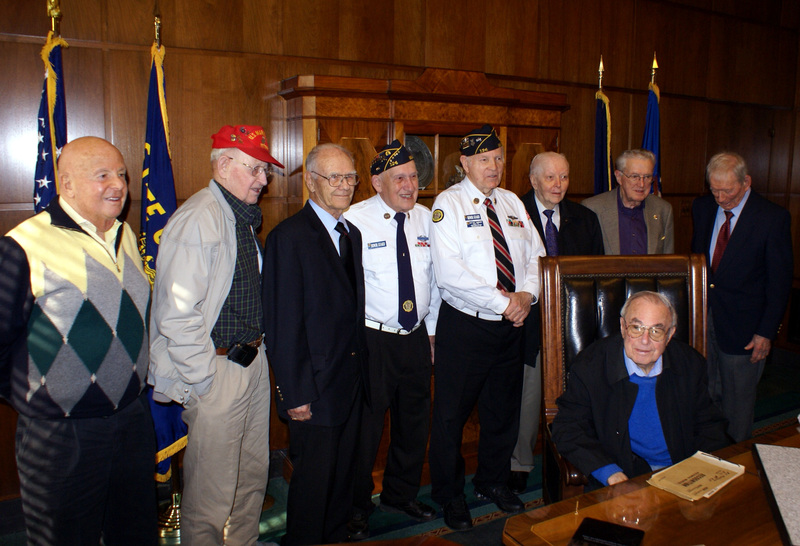 Below ... After the World War II Memorial Honor Day ceremony, veterans of that war gathered around the governor's ceremonial desk (L-R): Gerry Frank, Don Guthrie, Bob Maxwell, Frank Passmore (Post #124), Marv Doty (Post #124 Commander), Art Sorenson, Bill Markham and Leonard DeWitt. Seated: Larry Epping. 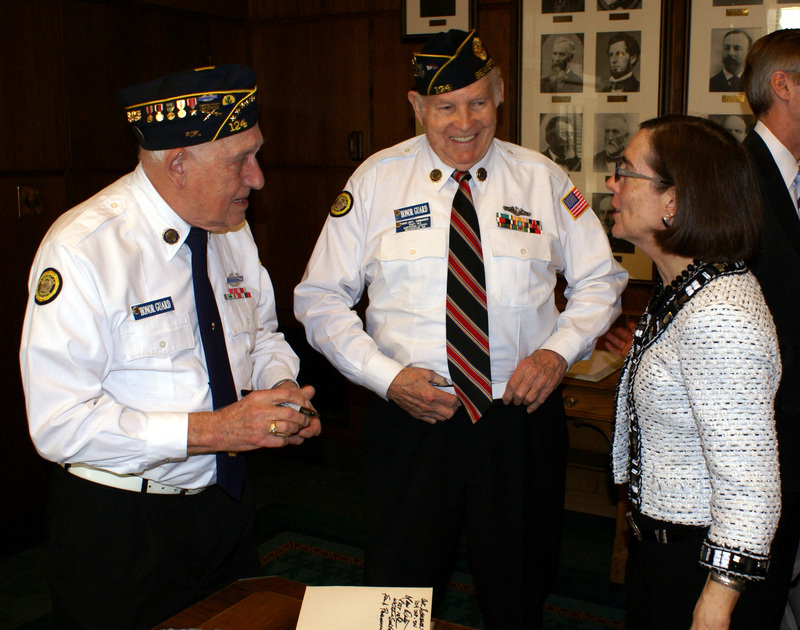 Above ... American Legion Post #124 members, Frank Passmore and Marv Doty (Commander) visit with former Oregon Secretary of State Kate Brown.